Have you ever been ice fishing? There you are, out on the frozen expanse, huddled in a shack and focuses all your attention on a hole in the ice. Well, half your attention. The other half is all about talking to your friends and throwing back a beer. 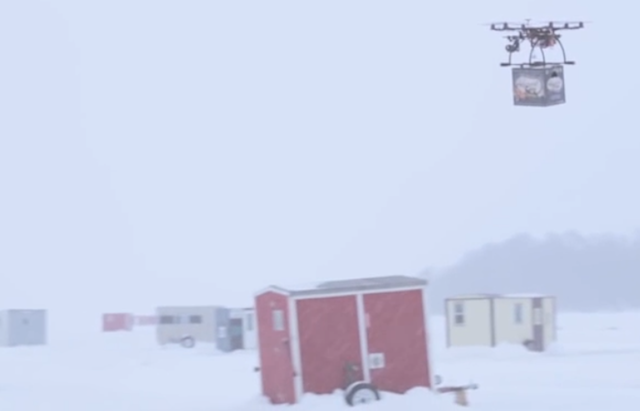 But one local brewery got in a spot of trouble for trying to make the beer part easier with a drone that delivered frosty cold drinks right to your ice fishing shack. The Federal Aviation Administration frowns on people sending out their own drones into the skies, but the owners of Lakemaid Beer figured they were just doing thirsty fishermen a favor by ferrying drinks through the air so they wouldn’t have to leave their toasty shacks. The company — which calls itself the fishermen’s lager — had just started the local deliveries near Stevens Point, Wis., but the Minnesota-based company had its eye on a bigger slice of the ice fishing pie, reports NPR’s The Two Way. It’d hoped to use the drones to shuttle beer to ice shacks from bait and beer shops all over the wintry north. Though it had only recently arrived in the skies, the FAA told the company its drones had to be grounded afer this first test. Drones aren’t allowed for commercial delivery, however, and as such the brewery can’t go on with its plans to use American airspace to bring thirsty fishermen (and woman, don’t you doubt it) a cold one. The FAA told Lakemaid in an email that it “recognizes that people and companies other than modelers might be flying UAS with the mistaken understanding” that their actions are legal. But those rules only apply to people flying model airplanes. The partner says he can see where the FAA is coming from (until someone from the FAA goes ice fishing and runs out of beer).